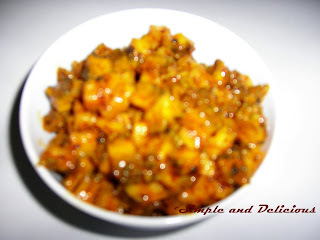 Bittergourd Pickle / Kaippakka Achar | Simple and Delicious ! Cut bitter gourd into thin pieces. Dry roast 2 teaspoons mustard and ½ teaspoon fenugreek seeds. Let 1 teaspoon of mustard seeds to splutter. Add powdered mustard, fenugreek and asafetida. Stir. Add salt, chilly powder and bitter gourd. Mix. Add little hot water,3 table spoons of vinegar and mix well. Close the pan and cook till the bitter gourd is done. Then add remaining 1 table spoon of vinegar and enough salt. Mix and remove from fire. I love bittegourd, havent tried it in a pickle!! Thx for sharing. Thanks for the recipe Seena. can we use lime juice instead of vinegar? Yeah Usha, since the amount is much, I prefer using vinegar.And mostly, for pickles we use vinegar in Kerala.Lime juice is usually for salads. Oh ! ok seena! can you give me some tips for making Aapams?